In this poor satirical news report, a student with a strong concept does not develop its potential. People believe in global warming in the summer when it hot or in the winter when it is warm. That's a new study. If a summers cold, they say its "global cooling." That's not a thing. If the winters real cold, they say, "Wheres my global warming." "That's not how global warming works," says Mr. Burke, my 7th grade earth science teacher. "It's not about the day to day. It's about the long term. People are too wraped up in the moment." A study showed college men on spring break believe the world is "getting hotter." College women said the world was "not hot enough." A seperate study showed old people with bad circlation felt the world was "growing cold." Many also wondered why you never call. Global Warming Is Weather-Dependent by Thoughtful Learning is licensed under a Creative Commons Attribution-NonCommercial-ShareAlike 4.0 International License. 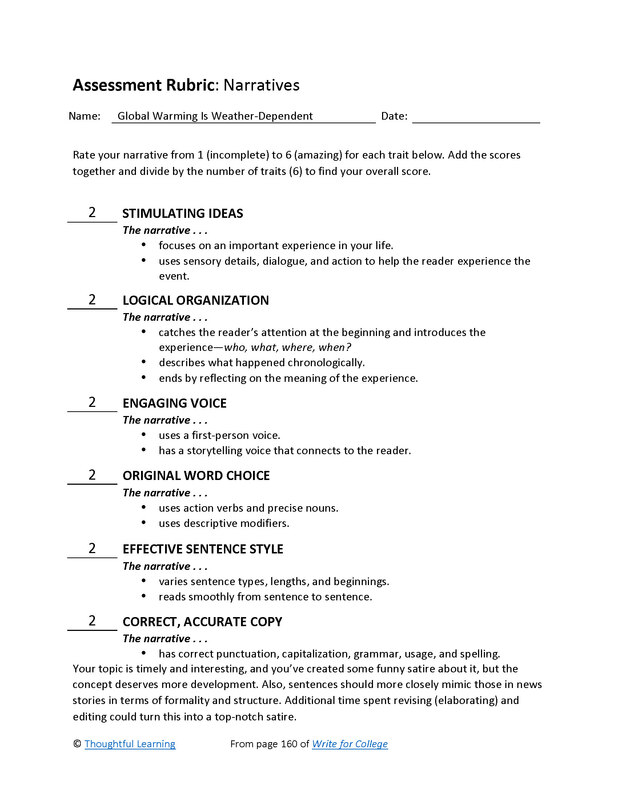 Based on a work at k12.thoughtfullearning.com/assessmentmodels/global-warming-weather-dependent.